Where is it ? 75 Kilometres west of Faro Airport. About One hour fifteen minutes by car. Who goes There ? 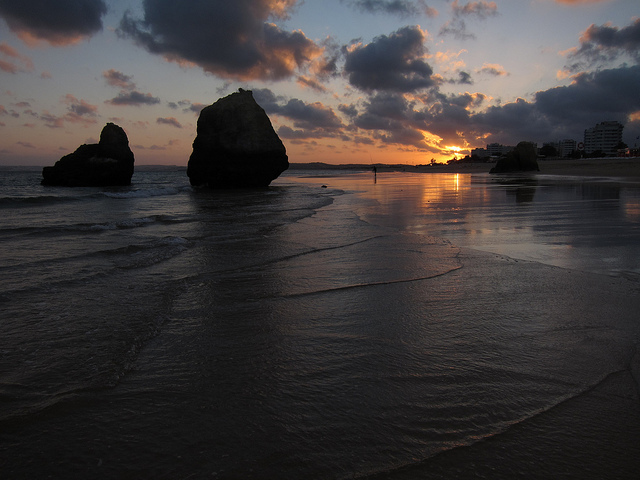 Although Praia da Rocha has some wild nightlife on offer around the west end, it is still very much a family holiday resort and like the rest of the Algarve it doesn’t attract too young a crowd. What about food and Accommodation ? A Skyline of Apartment blocks along the seafront will tell you that there’s always room at the inn in Praia da Rocha. Restaurants and cafes are plentiful. Mainly catering to a medium budget some finer dining can be found in nearby Portimao. Praia da Rocha, The beach of the rock is one of the more famous tourist havens in the Algarve and was one of the earliest towns of the Algarve to be developed specifically for Tourism. Originally an exclusive retreat for millionaires in the 1930’s, the resort took a downturn in the late 70s when it was over developed and marketed as a cheap package resort. Despite still having a seafront of higher rise apartments the town has upped its game in the last ten years. A major refurbishment of the run down west end in 2005-2007 has added some quality to the area. The town is within easy access of nearby water parks and the larger town of Portimao so provides an excellent base for family holidays. The two kilometre long beach was the original draw to Praia da Rocha and is still considered one of the best beaches in the entire Algarve. The main street of the town Avenida Tomas Cabreira runs along the cliff top separating the beach from the main town. The west end of the Avenida is cheaper and more commercialised and it is generally recognised that the resort gets classier as you travel east along the avenue.Popular with watersports enthusiasts it is considered a good place to start surfing. Nightlife in Praia da Rocha is very lively with pubs, music bars, clubs and discos. The main action for party animals is around the west end of the Avenida Tomas Cabreira which is one long strip of pubs and clubs. There are numerous restaurants where those wishing for a more intimate evening can enjoy a meal in a relaxing friendly atmosphere. There is also a casino for those who enjoy a holiday flutter. Not the most authentic of resorts by Algarvian standards but almost matches Albufeira for nightlife fun and hills! The Main bus to Portimao stops regularly in front of the Hotel da Rocha on the seafront.